Most of the comics are based on my own experiences, but many are based on the experiences of friends of mine or from submissions from fans. See the “characters” section for bios of each main character. 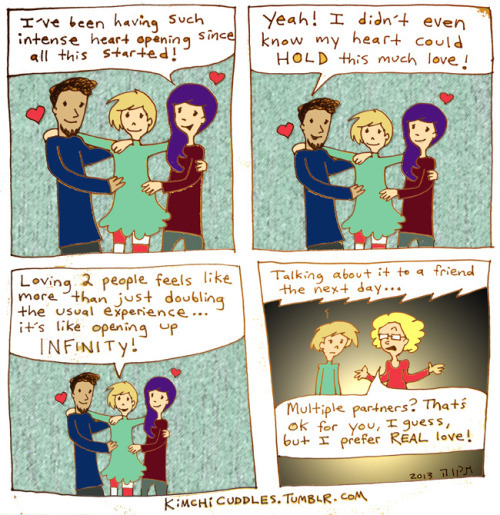 My main goal for making this comic is to spread awareness about ethical nonmonogamy in a way that is hilarious. If you like what you see, check back often because I post 2 new comics a day! You can also follow me on Facebook for comics updates and interesting posts on similar subjects. ...None of the main characters are based one just one person. Most of them are a jumbled mix of people I’ve had romances with who have similar personalities to each other. Their appearances are also the result of me creepily Frankenstein-ing various lovers of mine together. That doesn't count toddler Pumpkin, who's just one kid: "She’s that cute in real life too." Lots more comics! For ages now I've been occasionally updating my collection of poly webcomics. What ones have I missed? Please add them to the comments. I like this, but I wish the author would use something other than tumblr for it. I'd like to be able to read from the beginning, and blogs don't make that easy. There's a lot of good webcomic hosts out there (SmackJeeves, Webcomic Nation, etc). However, the comic is good, and I'll be reading it. I read them all. Why do I adore them so much?